The Florida Department of Transportation (FDOT) is improving drainage along State Road 20 from Osceola Street to U.S. 17 (Reid Street). This area holds large amounts of water during storms due to the size of the current drainage pipes. Installing new drainage pipes along State Road 20 will allow water to move more efficiently from U.S. 17 to the St. Johns River. The five-phase construction project includes, removing the top layer of asphalt and replacing it, installing new drainage pipes under the roadway, new storm drain construction, base work, curb and gutter improvements, sidewall and driveway construction, utility work, landscaping and other incidental construction items. Periodic lane closures and road closures will be necessary throughout construction. Sidewalk closures may occur during the project; however, signage for pedestrian detours will be in place. Trucking traffic should utilize the existing truck route for State Road 20 and vehicles should adhere to the guided detours installed. Throughout each phase of this project, a portion of State Road 20 will be closed to all vehicle traffic to safely complete the work. 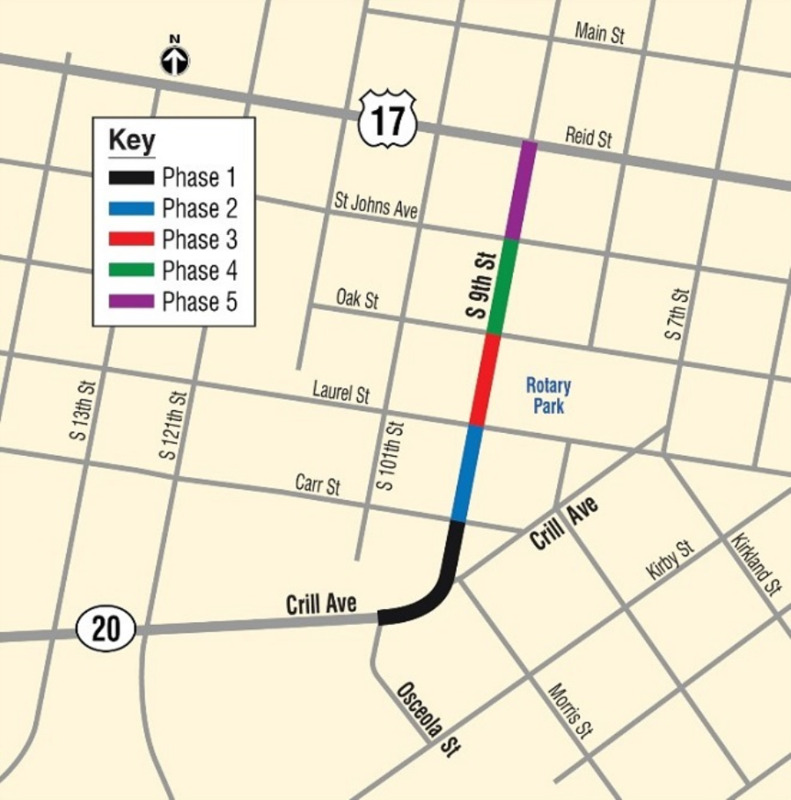 The road closures planned for each construction phase are listed and color coded on the provided map (figure 1). Each phase of work is expected to take between four to six weeks, weather and special circumstances permitting. The additional map provided (figure 2) displays the current detour in place for motorists. Halifax Paving Inc. was selected to complete this project. Full road closure from Laurel Street to Carr Street until early 2019 for drainage work.